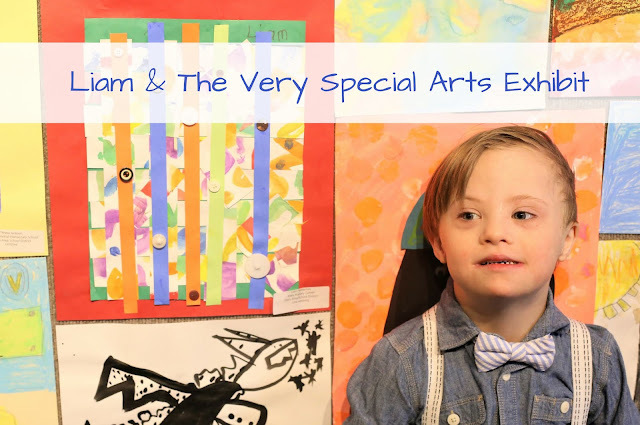 The Very Special Arts Exhibit was at Grove City College, which is about 45 minutes away from where we live. A good family friend came along with us, and my parents met us there. It was our first big family outing since Coen was born, so we really appreciated the extra sets of hands! When we arrived, we registered Liam, then he received a bunch of awesome participation gifts, including a backpack, shirt, water bottle, certificate, Wendell August Forge medal, sketch pad, and art kit. He was especially excited about the backpack! We then got our first picture as a family of 7 taken on the "red carpet!" While we were there, I got to meet some awesome people from the Midwestern Intermediate Unit who know one of Liam's special ed teachers (she was a preschool teacher for the IU), and we also saw one of Liam's preschool teachers who taught him for a few weeks last year. It's funny how many people knew Liam or knew of him by name! We finally headed into the gallery to see the art exhibit! There are a lot of talented young artists. I was really impressed by some of the pieces! I had no idea what Liam made, and wasn't sure what to expect. Truthfully, Liam isn't a big fan of coloring, writing, or painting, but when I saw his piece, it made sense. He definitely likes to use glue!!! Liam did end up recognizing his artwork, and he seemed really happy to see it hanging on the wall. He happily showed it to his siblings and grandparents, then ran off toward the door, since there was a lot of fun things to do outside of the gallery! Although Liam is a master escapee and super fast runner, I couldn't really blame him for leaving. There were cookies, cake, and face painting in the lobby, and a fun tent filled with art activities outside. OF COURSE, Liam took off for the tent. At that point, my parents headed home with Dylan. Grant, our friend, and I ended up dividing and conquering. The girls and Liam wanted to go in the art tent, and the baby wanted to be snuggled. Grant held the baby and stood watch over the stroller while I took the other kids into the art tent to make sand art necklaces and other little crafts. Liam was over it quickly and wanted to move on, so our friend trailed after him while I finished helping Lily. Then Coen needed to be fed, the girls wanted their faces painted, and Liam wanted cake, so we split up yet again. Liam wanted to go into the gallery one last time before we left, so a freshly painted Lexie and I took him in to see his artwork again. When he spotted his artwork, he pointed at it and got a big smile on his face. It is so wonderful to see him thriving and having fun within an inclusive school environment! When we came out, Lily's fancy face painting was done, so we grabbed some cookies and cake, and ate our snacks outside before heading home. Our first big family outing was fun and successful, but Grant and I were exhausted and feeling very grateful that we had helpers! It was an exciting day for Liam, and he quickly fell asleep on the drive home! We are so proud of our sweet boy. Even more so, we're very happy he loves school and has so many amazing oppportunities such as this one! We can't wait to see what the future holds for our awesome son! 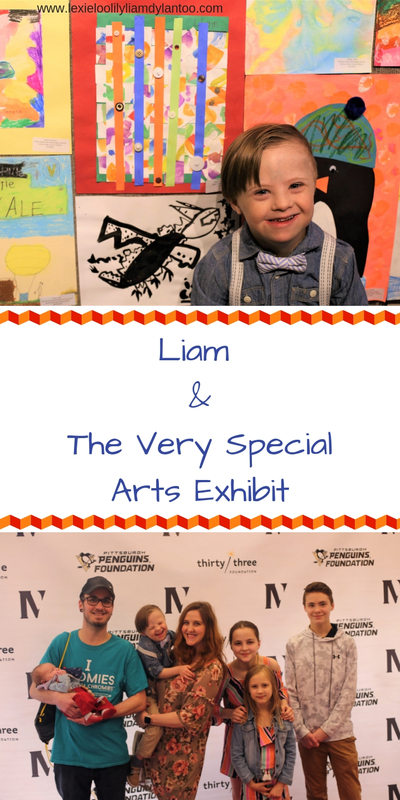 If you're in the Greater Pittsburgh area, you should check out the awesome Very Special Arts exhibit. It's open to the public at Grove City College, in the Pew Fine Arts Center, until April 17th! Liam looks so proud of his art work! So cute!